During a late December cold front, Dr. Stephen Holland and Vivian Baguer Holland were enjoying some time at their waterfront home on Lake Tashmoo. The thermostat read 12 degrees outside but it felt like 5. Inside was a comfortable 69 degrees, despite there being no roaring wood stove, clanking radiators, or baseboard heat. The Hollands don’t have a traditional heating system at all. 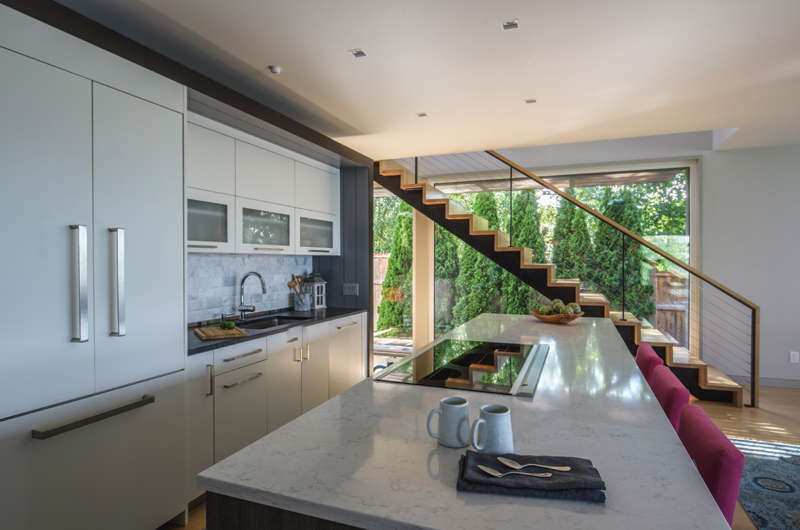 Their two-story, approximately 2,500-square-foot home is certified passive by the Passive House Academy (one of two relevant certifying agencies in the United States), meaning it requires almost no energy to heat or cool its four bedrooms and three-and-a-half baths. When I visited the house a few weeks earlier, wind ripped over the white-capped pond as workers from Contemporary Landscapes fought a hard-won battle against fallen leaves. But for all the clamor and chaos outside, inside there was silence. It was both unsettling and exhilarating to stand in that snug living room and watch the world spin madly on but neither feel nor hear the effects of any of it. “Like being in a cocoon,” said Vivian. The great room’s large windows offer sweeping views of Lake Tashmoo. A passive house is built so efficiently that it requires extremely little energy for heating or cooling. With an energy recovery ventilation system, insulation, and no air or thermal leaks – “thermal bridges” – a house can theoretically be heated entirely from the sun, body heat, and excess heat from appliances, including a television set. 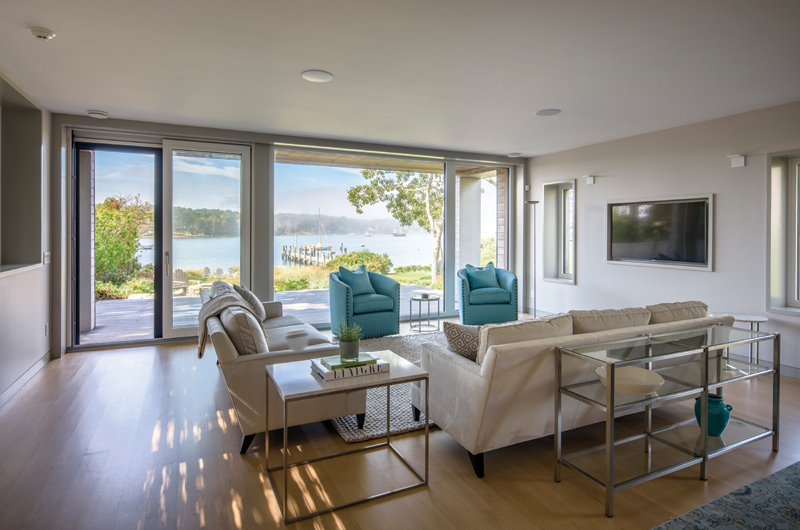 Cooling a passive home depends on strategic window placement and, in some settings, the use of a brise-soleil, an architectural structure that deflects sunlight. To be a certified passive house, the building must meet a rigorous standard of energy efficiency. Though the certification is intense, it can be broken down to three main tenets: proper insulation, air-tightness, and no thermal bridges. The passive house metric was developed and refined in the late 1980s by Dr. Wolfgang Feist, a German physicist, and Dr. Bo Adamson, a Swedish scientist. The first passive-house residence was built in Darmstadt, Germany, in 1991. The first passive house in the United States was built in Urbana, Illinois, in 2003. Located about a mile outside of downtown Vineyard Haven on the eastern shore of Lake Tashmoo, it was designed by Hutker Architects and built by Farley Pedler of Farley Built Inc. The view from the lot is stunning and its proximity to the water enviable, but its size and shape posed some design challenges. The lot is roughly sixty-five feet wide and more than nine hundred feet long, shaped like a shoe box. When the Hollands bought the property in 2011, the existing house was just a camp. It had no insulation and drafty windows, and was definitely not suited for four-season living. Stephen and Vivian enjoyed the space as a summer cottage for four years, but knew they’d eventually like to live in their Vineyard home year round. Once the roof started to leak, they decided it was time. A bunk room, evocative of old Vineyard camps, is given a bright, modern upgrade. Vivian had long been fascinated by passive homes, and as soon as they made the decision to tear down the original structure and build their dream house from scratch, she knew that they would build passive. 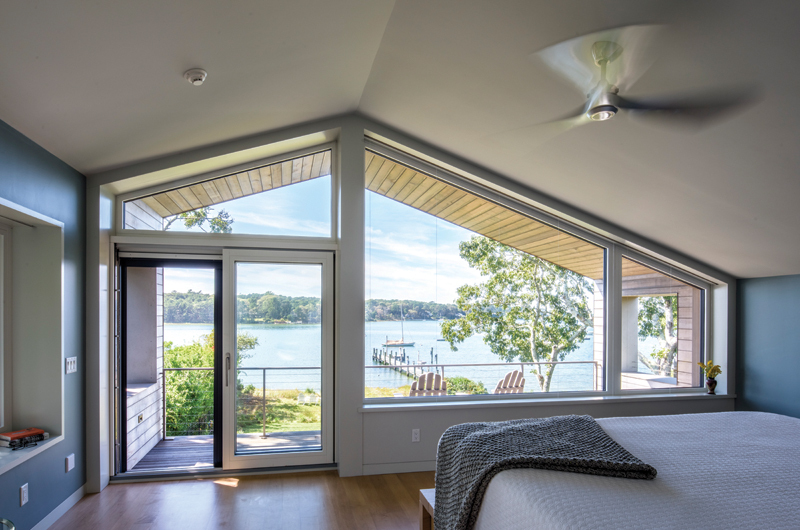 While there are at least two other passive homes on Martha’s Vineyard, this would be Hutker Architects’ first. And they were enthusiastically on board. “It’s a building theory we studied in school but we’d never worked on one,” said project manager Sean Dougherty. And Pedler, who built his own certified passive home in West Tisbury in 2013, was an obvious choice to build it. lake that the Hollands enjoy so much. That oven? It’s electric! No sources of combustion are allowed in passive homes. Under the watchful eye of Pedler and Dougherty and one of Hutker’s principal designers, Greg Ehrman, the Hollands’ house came to fruition as a living, breathing structure last year. Literally – the home breathes. Through a complicated web of ducts connected to an energy recovery ventilation (ERV) system, the home takes in fresh air constantly and expels stale dirty air. Sounds logical, but that dirty air contains valuable heat that the fresh air intake lacks. The ERV is able to extract the heat from the exhaust air and transfer it to the clean air without mixing any of the dirty particles. To maintain a steady temperature, the amount of air coming in and going out must remain equal. All that work and the system is completely silent. Passive homes typically can’t contain any sources of combustion, including heating systems. Instead, “the holistic approach to building allows the mechanical systems to be much smaller than a typical home, because the temperature swings and required energy loads are diminished due to a very tight and high insulated envelope, high performance windows and doors, no thermal bridging, etc.,” explained Dougherty. The simple master suite has its own deck over-looking Lake Tashmoo. The importance that the passive house standard puts on ventilation is unique. Typically air flow is not something that architects, designers, and builders spend a lot of time on, but the constant flow of fresh air offers some marked benefits. Allergens and mold are lessened when fresh air circulates in an air-tight space. “In a typical home, when you go to bed, you likely close the bedroom door. All night stale air circulates with no way out,” Duclos explained. And when you sleep in a space where fresh air circulates constantly, you might wake up feeling clear-headed and truly refreshed. Pedler said that the level of comfort his passive home provides has a downside: “It makes you not ever want to be anywhere else,” he joked. All that moving air also helps to usher out smells – whether from the kitchen or the bathroom – before they have a chance to linger. A home that functions like a robot does not come cheap. Pedler estimates that passive homes are 10 to 15 percent costlier than traditional ones. But it’s hard to put a dollar value on some of the perks: pristine air quality, overall comfort, and the peace of mind you might reap knowing you’ve lightened the planet’s carbon load. For help with interior aesthetics, the Hollands turned to Carol Friedman of Design Resource in Concord, who helped choose tiles, stone, and lighting, before shifting her focus to finishing details including furnishings, rugs, and color coordination. She described the Hollands as ideal clients who knew what they wanted and were gracious in conveying it. In her design work, she has seen an uptick in energy awareness and people wanting to minimize their footprint, but this was her first passive house and it left a lasting impression. “I was excited to be a part of the team on this project. It’s a beautiful home and comfortable for a family retreat and possible full-time home in the future,” she said. The Hollands love their quiet, cocoon-like home, but they’re also still getting to know it. It’s a little more hands-on than your typical house. “You have to push a button to activate the ERV system every time you go into the bathroom,” said Stephen. And because there is no gas in the home at all, they’ve had to learn to cook with an induction oven. In the next few years they’re hoping to get off the electrical grid entirely with the installation of more solar panels. For the Hollands the motivation is simple. “We want to protect the pond. And be good neighbors,” said Stephen. You state, "The passive house metric was developed and refined in the late 1980s by Dr. Wolfgang Feist, a German physicist, and Dr. Bo Adamson, a Swedish scientist. The first passive-house residence was built in Darmstadt, Germany, in 1991. The first passive house in the United States was built in Urbana, Illinois, in 2003." There were many passive solar homes well before this, such as "Village Homes" in Davis CA, where I lived in 1979 -- already hundreds of "passive" homes built there. We also had a practice, Davis Alternative Technology Associates, there providing designs and advice virtually all over the planet, and had lots of international visitors. This makes claims you make about Messr's Feist and Adamson, well, a bit out ragious. Ed Mazria published "The Passive Solar Energy Handbook" in 1979. And there were a set of published volumes on passive building well before that.